OFFICIAL BLURB: The Northern Sunrise is a standalone book by the author of The Ties that Bind trilogy. Set in a new world of corruption, deceit and thievery; mixing magical fantasy and alchemy-punk with a healthy smattering of airshippery. FORMAT/INFO: The Northern Sunrise is divided into twenty-five chapters and an epilogue. The narration is in third person via Isabel de Rosier, Jacques Revou, Shadow concieller Renard Daron, and Amaury Roche. This is a standalone story. 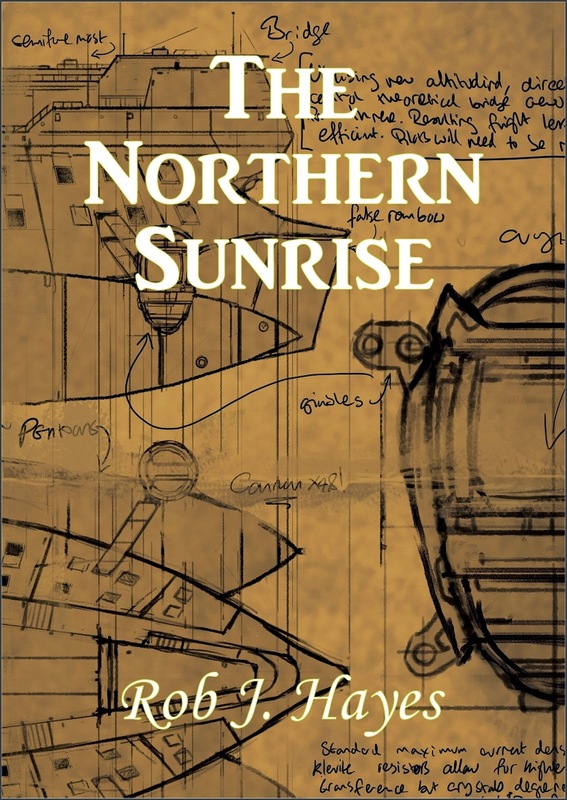 March 19, 2014 marked the US and UK e-book publication of The Northern Sunrise and was self-published by the author. ANALYSIS: After reading Rob J. Hayes’ debut effort, I was suitably impressed. With this tale being a standalone and specifically not related to his previous trilogy, I was wondering how this effort would turn out be. Isabel de Rosier and Jacques Revou are two consummate thieves who have accomplished several different sorts of heists and larceny. Their most recent efforts have them squarely in the sights of Renard Daron, the shadow conceiller to the king of Sassaille. Isabel and Jacques are forced into a final job for Renard Daron and fiercely watched by Daron's two deadly shadows Franseza Goy & Amaury Roche. Going into a job blind, has never been their sort of thing but with all their bank accounts frozen and with not a single penny to their name. Isabel and Jacques must learn to dance to the shadow conceiller's tune however they are not without their own tricks. As with the previous books, the characters are what make this story so enjoyable, beginning with our main characters, who are quite an adorable duo. They keep the story from getting too dreary and also keep the reader entertained. Another plus point is that the author makes their voices distinct so as to not confuse them. Also with the other POV characters, they are quite individualistic and also make the story that much more intriguing. Ultimately this story is about wills and the deception that people engage in. With Isabel and Jacques, it’s all about their skills in fooling people into believing whatever they want them to. With Daron, it’s basically about the kingdom and its needs, however what Daron thinks what’s best for the kingdom might not be entirely correct. CONCLUSION: The Northern Sunrise by Rob J. Hayes is a surprisingly fun thriller even though it deals with deception, spy craft and other dastardly activities. Rob J. Hayes certainly is his own writer and know how to buck reader expectations and give a story which while different is no less a pageturner. I have just finished reading this and thoroughly enjoyed it. The main two characters are likeable and amusing. If you like steampunk I suggest you read it.